It will take generations for Iraq to recover from the 2003 catastrophe ignited by the Bush administration. Iraqis went to the polls today. At least, that’s the official story. But how can a country have an election when it’s embroiled in virtual civil war conditions, run by a gangster politician enforcing a Shiite, sectarian agenda, with some of its major cities besieged by a rough alliance of Al Qaeda, the Islamic State of Iraq and Syria (ISIS), and thousands of angry, disaffected Sunnis? Plus, with its Kurdish north careening toward breakaway, independent status? The tragedy of Iraq continues. Nearly 9,000 Iraqis died last year in violent attacks, suicide and car bombings, and civil war–style violence, and that’s probably an underestimate. In 2014, about a thousand a month are being killed—not quite Syrian levels, but far worse than, say, in Afghanistan. (See the United Nations Assistance Mission in Iraq for month-by-month details, which understate the deaths.) And since the criminal invasion of Iraq in 2003 by the George W. Bush administration and its neoconservative allies—along with its liberal-interventionist co-thinkers, such as John Kerry and Hillary Clinton—Iraq has been plunged into a never-ending nightmare, its body politic ripped asunder, its civil and industrial infrastructure destroyed and its population reduced by at least several hundred thousands who died. Countless millions more suffer from grotesque injuries, psychological trauma and PTSD—especially children. 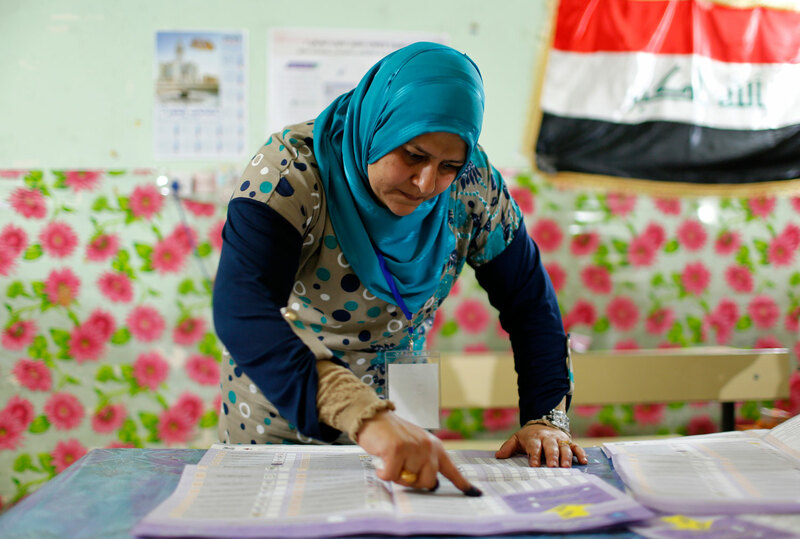 It’s a testament to the strength and determination of Iraqis that they can have an election at all. But the result isn’t likely to improve Iraq’s pitiful situation, especially since Prime Minister Nouri al-Maliki—the would-be dictator and president-for-life—is almost certain to remain in power, provided that he can cobble together another parliamentary coalition that rests chiefly on his fundamentalist, Shiite-sectarian base. His popularity has been declining in recent years, but now his thundering war against Sunni “terrorists” in Ramadi, Fallujah and the rest of Anbar province, along with somewhat less intense crusades in Salahuddin province, in Mosul and elsewhere, may have managed to stir up enough Shiite sectarian excitement that he can pull off a sizable plurality of the vote. Back in 2010, when an opposition party led by Ayad Allawi—a wily, nonsectarian, secular Shiite politician with a largely Sunni base—won the biggest share of the vote, both the United States and Iran weighed in to prop up Maliki and ensure that he was able to form a government that eventually excluded Allawi. A year later, in 2011, the remaining American troops departed, and within days Maliki went to war against Sunni politicians, the Sunni establishment and others who opposed his authoritarian style. Maliki used spurious charges of terrorism against top politicos, including the Sunni vice president of Iraq, who was forced to flee for his life. Following that, Maliki cracked down viciously on peaceful, Arab Spring–style protests in Anbar, killing hundreds and detaining thousands. So, it’s no wonder that the Iraqi insurgency that erupted after 2003 is back. This time, it’s enhanced by the chaos in Syria, where a largely Sunni army of Islamist fanatics and rag-tag rebels tied to Al Qaeda and ISIS are battling the government of President Bashar al-Assad. Cities such as Ramadi and Fallujah have turned into strongholds of the insurgency, and the anti-Maliki radicals have deployed waves of suicide bombers and car bomb experts to slaughter thousands of Shiite civilians in markets, public squares and other soft targets. They’ve also carried out a lethal pattern of assassinations of moderate and establishment Sunnis outside Baghdad. Vital American interests are at stake.… Navigating Iraqi politics in the coming months will require a level of deftness, balance, and steadfastness that has eluded the Obama Administration’s Iraq policy to date. However, given the strong relationships that Washington has with key Iraqi leaders and factions, the United States still possesses sufficient leverage in Iraq for securing a government that is beneficial for Iraqis and friendly with the United States. It’s too late, Zal. The United States has little or no influence in Iraq anymore, just as it has little or no influence over the civil war in Syria, the undemocratic actions of the government in Egypt and the scattered militias of chaotic Libya. Iraq, torn between its Shiites, Sunnis and Kurds and pulled this way and that by Iran, Saudi Arabia and Turkey, will make its own way—and its own mistakes. And it will take several generations for Iraq to recover from the effects of its destruction in 2003.